But the ‘mystery of the moving mummy’ – which has seen an Egyptian statue mysteriously start to spin round in a display case – has spooked museum bosses. The 10-inch tall relic, an offering to the Egyptian God Osiris, was found in a mummy’s tomb and has been at the Manchester Museum for 80 years. But in recent weeks, curators have been left scratching their heads after they kept finding it facing the wrong way. They now believe there could be a ‘spiritual explanation’ for the turning statue. It is believed that there is a curse of the pharaohs which strikes anyone who dares to take relics from a pyramid tomb. Experts decided to monitor the room on time-lapse video and were astonished to see it clearly show the statuette spinning 180 degrees – with nobody going near it. Now scientists are trying to explain the phenomenon, with TV physicist Brian Cox among the experts being consulted. Scientists who explored the Egyptian tombs in the 1920s were popularly believed to be struck by a ‘curse of the Pharaohs’.Now Campbell Price, a curator at the museum on Oxford Road, said he believes there may be a spiritual explanation to the spinning statue.Egyptologist Mr Price, 29, said: ‘I noticed one day that it had turned around. ‘I thought it was strange because it is in a case and I am the only one who has a key. ‘I put it back but then the next day it had moved again. ‘We set up a time-lapse video and, although the naked eye can’t see it, you can clearly see it rotate on the film. ‘The statuette is something that used to go in the tomb along with the mummy. ‘Mourners would lay offerings at its feet. The hieroglyphics on the back ask for ‘bread, beer and beef’. 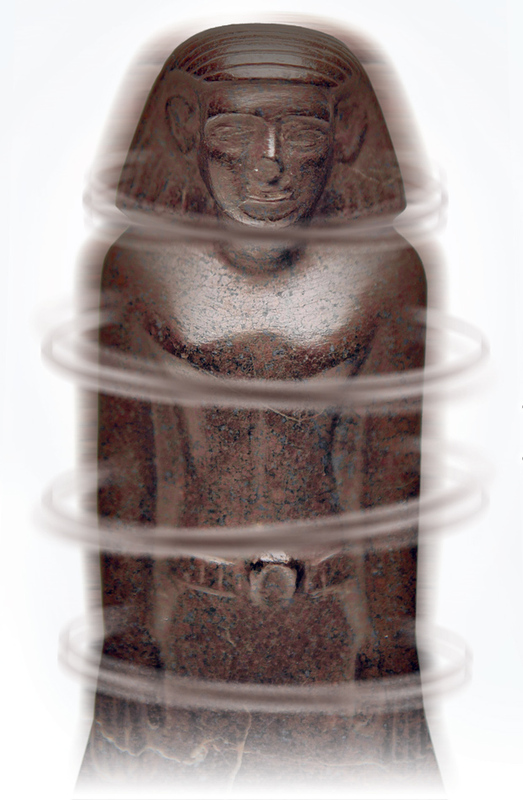 ‘In Ancient Egypt they believed that if the mummy is destroyed then the statuette can act as an alternative vessel for the spirit. Other experts have a more rational explanation – suggesting that the vibrations caused by the footsteps of passing visitors makes the statuette turn. That’s the theory favoured by Professor Cox – but Campbell said he was not convinced. ‘Brian thinks it’s differential friction,’ he said. ‘Where two surfaces, the serpentine stone of the statuette and glass shelf it is on, cause a subtle vibration which is making the statuette turn. Campbell is urging members of the public to come along and take a look for themselves. ‘It would be great if someone could solve the mystery,’ he added.